recorded in the Teatro Massimo, Palermo, 1st May, 2002. This DVD is a permanent record of yet another May Day concert given by the Berlin Philharmonic Orchestra, this time in the beautiful surroundings of the Teatro Massimo in Palermo. The DVD comes complete with a short (20 minute) documentary on Palermo and its theatre which whilst not worth buying the DVD for, is a very good bonus and well worth having, particularly if you have been on holiday in this city. The disc is a co-production with a number of European broadcasting organisations, and once again, the BBC is noticeably absent from the proceedings. The concert is directed by the usual DVD director, Bob Coles. His name is promise enough that you are in for a visual as well as an audio feast. The concert gets off to a very lively start with Beethoven�s Egmont overture. As you may know, Abbado has just recently completed a Beethoven Cycle (also in Italy, but Rome). I am not sure whether Sicilians consider themselves Italian, but no matter. The theatre is a spectacular visual feast, and Bob Coles makes the best of this. Abbado�s style with Beethoven is quite well known, and here the interpretation is clear and direct with plenty of adrenaline flowing in the closing pages. The orchestra is then joined by Gil Shaham for a performance of the Brahms Concerto, which Abbado and he recorded some years ago for DG. This studio performance was well received and I am pleased to be able to say that this performance is similar and well worth having on DVD. I do not know how he does it, but with Shaham, I find that there are very few extraneous noises from the instrument, and this is replicated here. The main work is the Dvoř�k Symphony, complete with first movement repeat, and played with the kind of commitment that one is used to hearing from the Czech Philharmonic. 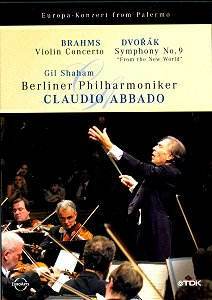 Towards the end of his tenure with the Berlin Philharmonic, Abbado had a long and serious illness, which some pundits reckoned he wouldn�t survive. On the visual evidence of this concert, he still wasn�t out of the woods, even allowing for his deep suntan. However his control of the orchestra is never in doubt, to say nothing of their commitment to their Music Director. They receive a tremendous response from their Sicilian audience (standing ovation plus a deluge of flowers) which is rewarded with an encore. In the circumstances this was highly appropriate to the location. Here, Abbado is in his element with Italian Opera: the overture fizzes with excitement. One would not believe that we had reached the end of a long concert and the audience once again goes wild. In common with other Southern European cities, the conductor continually is recalled for curtain calls after the orchestra has left the podium. Almost, but not quite as good as being there.